It’s official: VA-11 Hall-A is heading to Switch. Sukeban Games announced today that it’s game will be released on Nintendo’s console in early 2019. 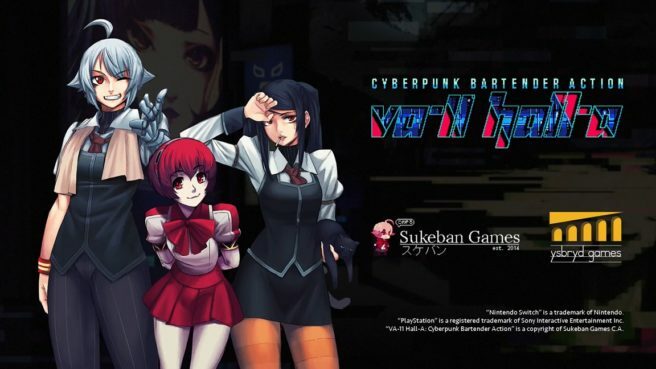 VA-11 Hall-A seemed to be destined for Switch after a designer and artist at Sukeban indicated that it was happening. However, this is the first time we’re hearing about it officially. Continue on below for details about VA-11 Hall-A, as well as a console trailer. VA-11 HALL-A: Cyberpunk Bartender Action is a booze em’ up about waifus, technology, and post-dystopia life. In this world, corporations reign supreme, all human life is infected with nanomachines designed to oppress them, and the terrifying White Knights ensure that everyone obeys the laws. But, this is not about those people. You are a bartender at VA-11 HALL-A, affectionately nicknamed “Valhalla.” Although it is just a small bar downtown, it attracts the most fascinating people this side of dystopia. Keep your clients lubricated and you will be made privy to the most interesting stories. Learn about daily life in the cyberpunk dystopia of Glitch City. A branching storyline where your decisions do not depend on traditional choices, but through the drinks you prepare. Visuals inspired by old Japanese adventure games for the PC-98, with a modern touch for an otherworldly experience. Get to know your clients, their tastes, and prepare the drink that will change their lives.